The Katori Shrine (香取神宮, Katori Jingū) is a Shintō shrine in the city of Katori in Chiba Prefecture, Japan. It is the ichinomiya of former Shimōsa Province, and is the head shrine of the approximately 400 Katori shrines around the country (located primarily in the Kantō region). The primary kami of Katori Shrine is Futsunushi (経津主神, Futsunushi-no-kami), the kami of swords and lightning, and a general of Amaterasu. The foundation of Katori Shrine predates the historical period. Per the Hitachi Fudoki, an ancient record and per shrine tradition, it was established in 643 BC, the 18th year of the reign of Emperor Jimmu. 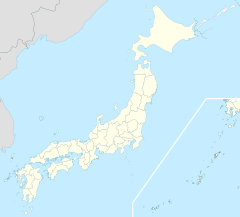 During this period, the Ō clan (多氏, Ō-shi) migrated from Higo Province in Kyushu, conquering local emishi tribes, and forming an alliance with the nearby Nakatomi clan, the progenitors of the Fujiwara clan at what is now Kashima Jingū. In the mid-Heian period Engishiki records, it is ranked alongside Ise Jingū and Kashima Jingū as one of three shrines with the Jingū designation. The Honden of Katori Shrine was traditionally reconstructed every 20 years, similar to the system used at Ise Shrine until the system fell apart during the Sengoku period. The current structure was built in 1700 and is designated as Important Cultural Property. The Rōmon gate of Katori Shrine was also constructed in 1700 and is also designated an Important Cultural Property. It displays the shrine's name plaque written by Fleet Admiral Tōgō Heihachirō. Katori Shrine holds one National Treasure, the Kaijū Budō Kagami (海獣葡萄鏡), a round cupronickel mirror with a diameter of 29.6 centimeters, and weight of 4.56 kilograms. Probably from Tang Dynasty China, the mirror is decorated with bas-relief flowers, insects and a variety of real and mythological animals. It is almost identical to a mirror held by the Shosoin Treasury in Nara. The mirror itself is preserved at the Nara National Museum. Furthermore, the shrine also has a ceramic Koseto pair of komainu, standing 17.6 and 17.9 centimeters high. Dating from the Muromachi period, one of these statues was featured on a 250 Yen definitive stamp of Japan. The set of statues is designated as an Important Cultural Property. ^ "Katori Shinto Ryu" (PDF). The Doshikai. Retrieved 2008-05-17. ^ 宝物・文化財. 香取神宮 (in Japanese). Archived from the original on 2009-07-03. Retrieved 2008-05-17. Clark, Timothy (2001). 100 Views of Mount Fuji. Weatherhill Books. ISBN 0-8348-0492-1. Wikimedia Commons has media related to Katori Shrine.